In order to alleviate traffic congestion along Apiary Road while also improving fish passage, a new bridge structure was needed. Since the original structure was perched, it was identified as a major obstacle to the stream's ecological functionality. With the invert higher than the stream flowing through it, the structure was a barrier to the passage and migration of salmon and needed to be replaced with a more fish-friendly option. In fact, juvenile salmon were observed trying to jump into the existing culvert, missing, and instead landing on the bank and being stranded. Since the road provides the only route for nearby logging operations to deliver logs to the mill, it was necessary for the replacement to occur quickly and efficiently. 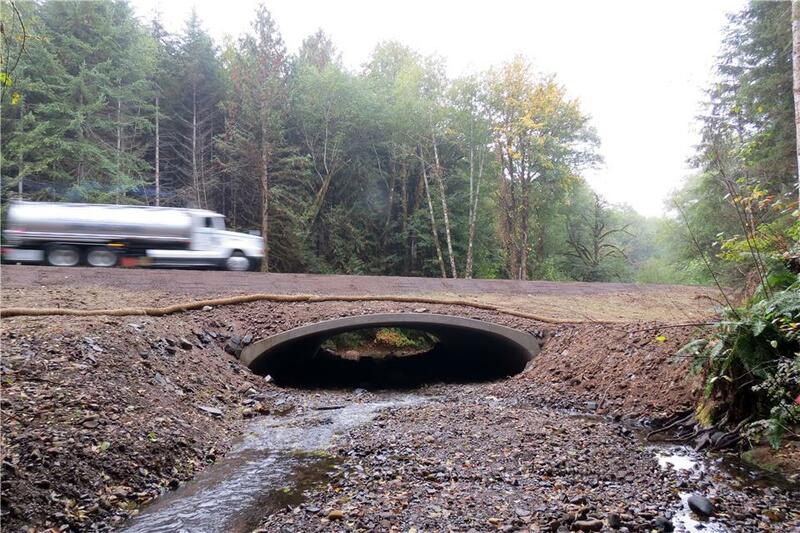 Upper Nehalem Watershed Council (UNWC), the project's owner, and Lower Columbia Engineering, the project's engineer, worked with Contech Engineered Solutions to select the best solution. After discussion between the team members, it was decided that the best solution for the stream crossing was a CON/SPAN® O-Series® Bridge System, 38’ span x 10’-8 1/8" rise x 84' long. The precast bridge units offered the most advantages over other options, including the speed of precast materials and the ability to meet the short construction deadline. Construction occurred during a tight schedule with only 10 days allowed for removal of the original structure and installation of the new one. All 14 precast arches were set in just one day via crane. The challenges on this project were met with the project being completed on time and on budget. "The CON/SPAN install was a complete success," concluded Maggie Peyton, Executive Director with UNWC. "I was impressed with the way the 14 sections fit perfectly into the keyway and locked together side by side with relative ease, greatly reducing the overall time of install and allowing us to open the road back up in a timely manner. We truly appreciated having a Contech representative's guidance through the design, build and install process, especially since he was on site during installation. We look forward to building our next CON/SPAN structure in the near future."